...to EWTN to watch the Fraternity of Saint Peter Priestly Ordinations, May 30th, at 11Am Eastern/8AM Pacific. His Eminence Dario Cardinal Castrillon Hoyos, President of the Ecclesia Dei Commission, will confer the Priestly ordinations. His Excellency, Bishop Fabian Bruskewitz will be sitting in choir. 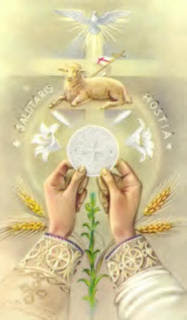 O Jesus, our great High Priest, hear my humble prayers on behalf of your priest, Father [N]. Give him a deep faith, a bright and firm hope, and a burning love which will ever increase in the course of his priestly life. In his loneliness, comfort him. In his sorrows, strengthen him. In his frustrations, point out to him that it is through suffering that the soul is purified, and show him that he is needed by the Church, he is needed by souls, he is needed for the work of redemption. O loving Mother Mary, Mother of Priests, take to your heart your son who is close to you because of his priestly ordination, and because of the power which he has received to carry on the work of Christ in a world which needs him so much. Be his comfort, be his joy, be his strength, and especially help him to live and to defend the ideals of consecrated celibacy. Amen. Praying for this special day!! I am praying for these future priests. Just one more day! I watched and I did catch one quick bonus glimpse of two beautiful little angelic girls sitting next to you husband:-). What a wonderful, grace-filled time for your entire family! The priests and Cardinal Hoyos are processing out of the church as I type. 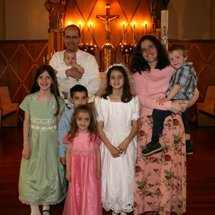 I was able to watch most of the ordination with some expected interruptions from children. May God bless your brother-in-law and the three other priests who were ordained today. Our future priests continue to be in our prayers. I left a comment in the earlier post ... your girls are absolutely STUNNING! Their eyes really grabbed my attention. So beautiful! 13 things I am looking forward to this month! Mitten Strings for God: Catching Up! Pentecost Sunday & Mother's Day! How did he do it?? ?